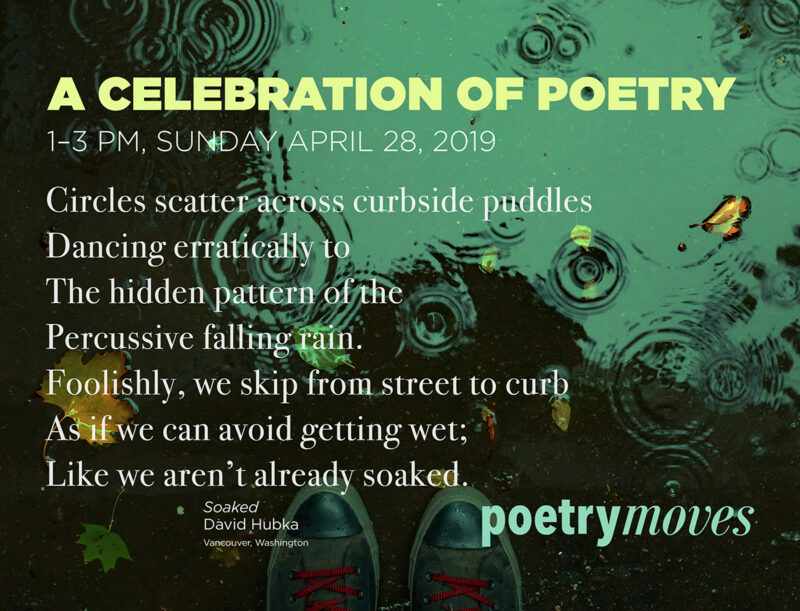 In its fourth year of bringing moments of joy, inspiration, or reflection to thousands of bus riders, C-Tran and Artstra invite the public to join in a celebration of poetry during National Poetry Month. Artstra’s Poetry Moves program displays poems from local and regional poets in every C-Tran bus, refreshed with new poems every six-months. The Sunday, April 28 celebration will be held in the Columbia Room of the Vancouver Community Library located at 901 C Street from 1 p.m. to 3 p.m. and will offer readings from the adult poets whose work currently appears on C-Tran buses as well as student poets whose poems appeared on the buses during the prior six month season of Poetry Moves. The free, afternoon event will also include music, light refreshments, and a dance interpretation of poetry. ‘Retired’ poem bus placards, suitable for framing, will be available for sale for $10 each as a fundraiser for the program. The current Season 7 poems were selected by juror and poet Mark Sargent, a native of Olympia, Washington who has lived in Sparti, Greece for the past 28 years. The Season 6 poems were selected from K-12 student poets, many of whom were first introduced to poetry through the ongoing Poetry in the Schools program begun by Christopher Luna, Clark County Poet Laureate, 2013-2017.